Daniels writes romantic suspense like no other. She keeps readers on her toes with this fantastic novel, while at the same time portraying all of the trials and tribulations of a real life romance. The plot was complex and very rewarding. Each and every aspect of the tale was tied to another, leading readers on an intricate journey that they won’t ever forget. Her picturesque Montana settings draw you in to ranch life, allowing you to experience this world to its fullest. I thoroughly enjoyed the characters that Daniels introduced us to throughout. The cast of this novel was all well developed and a joy to get to know. I enjoyed the fact that there were ties back to the original Beartooth, Montana series without being dependent on it for character development. Top this off with an unforgettable lead couple who had more than their share of troubles yet a love that will stand the test of time. I really appreciated how their personalities and histories contrasted one another yet at the same time they fit together perfectly. 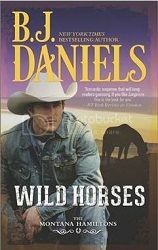 Daniels had definitely created a fantastic tale to begin her Hamiltons series. I wouldn’t hesitate to recommend it to those who enjoy romance with suspense and a healthy dose of ranch life, or to anyone looking for a romance that will touch your heart.